A leading kitchen products company successfully upgraded its Oracle E-Business Suite ERP from 11i to R12.2.6 in 8 months. The step-by-step process for completing the technical upgrade to R12.2.6. How they implemented R12.2 Mobile iExpense and iProcurement modules to eliminate manual expense approval, requisition, and procurement processes. A use case on simplifying complex integrations between Oracle EBS and 3rd party systems like Vertex Cloud, CardConnect for Credit Card Authorization, and Customer Bank Account information. 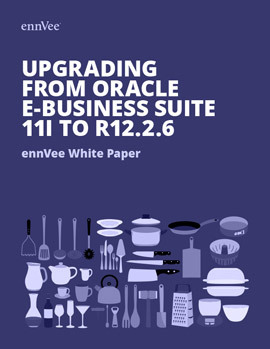 Download our complete R12.2 Upgrade Resources Bundle here.